Here are several confirmation notes given by Visegrad Municipality authorities to Bosniaks in 1992. This include: confiscating legally own weapons, travel permits and a signed oath of loyalty. 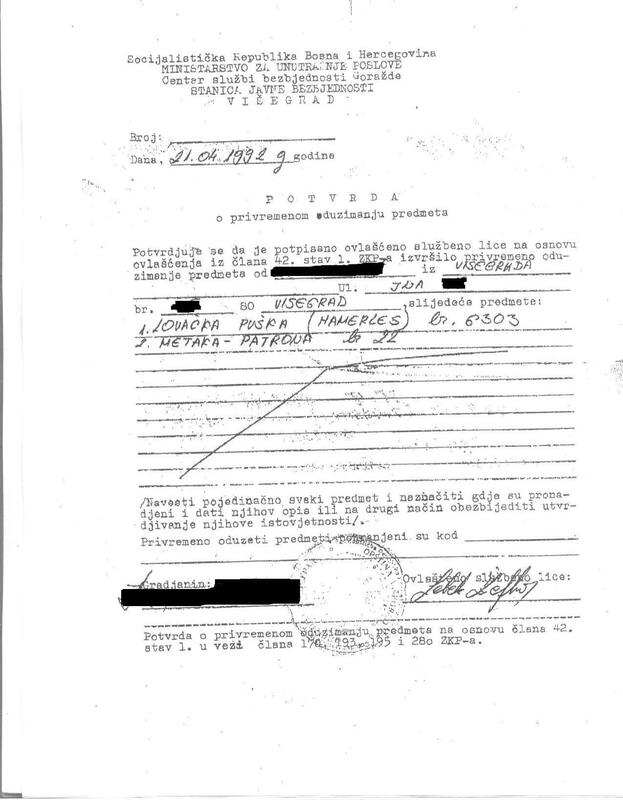 Image: A confirmation note issued to a Bosniak by Sluzba Javne Bezbjednosti – Public Security Station; a official security authority in Bosnian towns. 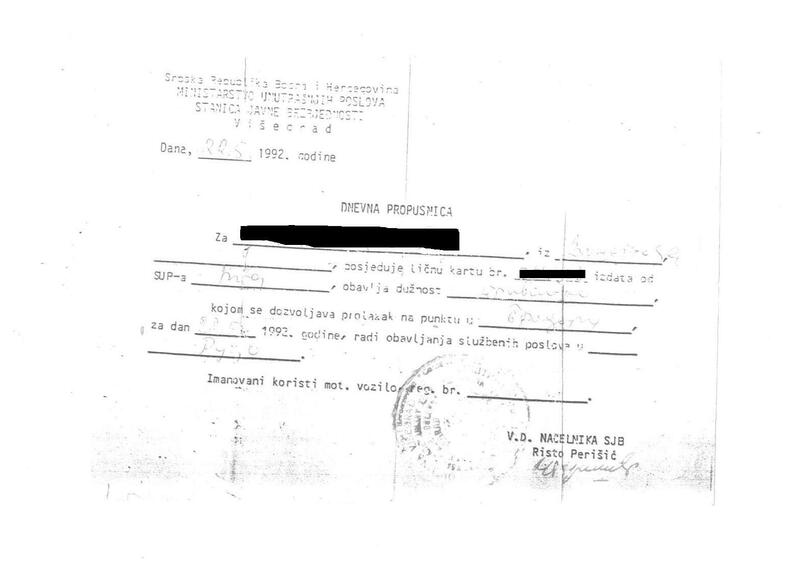 This note signed by war criminal Zeljko Lelek confirms that on 21.04.1992, Zeljko Lelek “temporary” confiscated a legally own weapon(a hunting rifle) from this Bosniak. 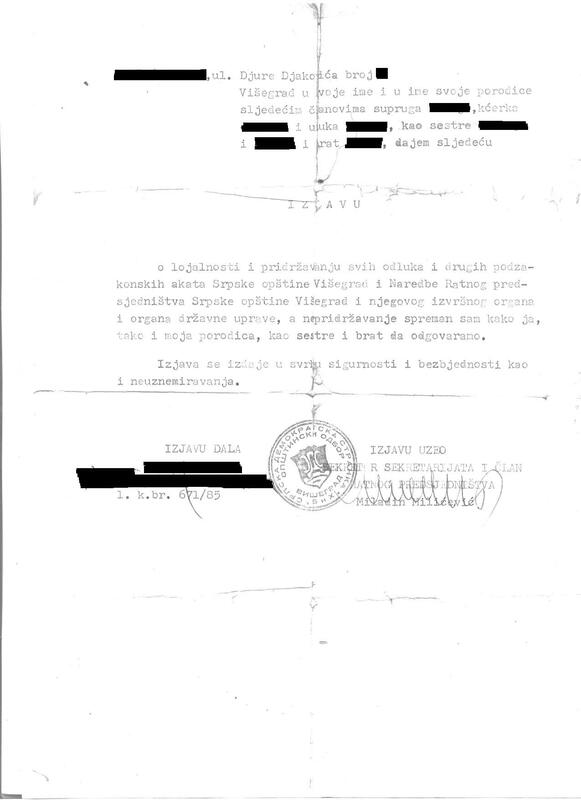 Image: A travel permit issued to a Bosniak by the Sluzba Javne Bezbjednosti(SJB) and signed by its Chief Risto Perisic. Permit was issued for business reasons on 22.05.1992. Bosniaks could not enter or leave without Visegrad authorities permission. Image: A signed oath of loyalty to the “Serb Municipality of Visegrad” whereas the undersigned shall respect all decisions and orders from the “Serb Municipality of Visegrad”; the “War Presidency of the Serb Municipality of Visegrad” and all other organs. The oath of loyalty was given purpose of security of the undersigned and his/her family. This statement was signed by a Bosniak civilian and by Miladin Milicevic, a member of the Visegrad War Presidency. Several dozen Bosniak families were forced or tricked into signing this “oath of loyalty”. In this family specifically, only one person managed to survive. In Visegrad there were two well-known live pyres: The Pioneer Street and the Bikavac live pyre. However there were a couple more live pyres which little is known about since there were no survivors. Here is the story of one of them. In the center of Visegrad, in the JNA Street(popularly known as Jondza), in Esad Brankovic‘s house around a dozen Bosniak civilians were burnt alive. This included: Vezima Hasecic(1952, the daughter of Demir Osman); Nermina(Remze)Hasecic(1977); Alma(Remze) Hasecic(1977); Osman Demir; Nefa Demir; Sulejmena(Mustafa)Tvrtkovic; Abida (Omerovic)Tvrtkovic and Selim (Sulejmena)Tvrtkovic(1975). They were last seen in Zulfo Hasecic’s house. The suspected perpetrators of this crime is the infamous Bosnian Serb Army Special Unit popularly known as the “Avengers”, “White Eagles” or “Garavi Sokak” which were led by Milan Lukic. 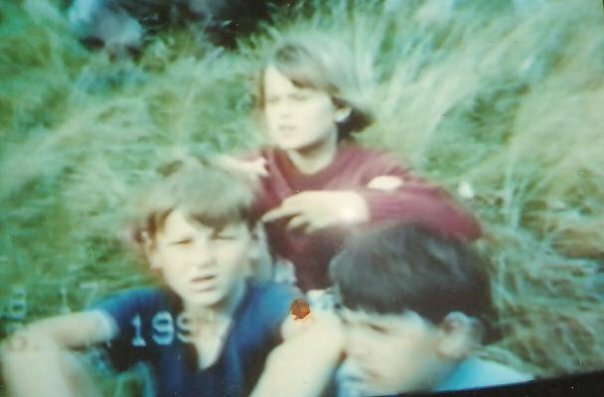 Image: In the center with dark hair, Nermin(Remze)Hasecic born 1977. Image: In the middle, Alma(Remze)Hasecic born in 1981. No one has yet answered for this live pyre. Visegrad Serb authorities have constantly obscured investigations and exhumations. The victim remains have most probably been moved to another location. During the Visegrad Genocide around 120 children were murdered or burnt alive by Visegrad’s Bosnian Serb Army soldiers or Bosnian Serb Police. On June 14 1992, in Pioneer Street(Pionirska Ulica) in Visegrad around 60 Bosniak civilians, (women, children and elderly) were barricaded and burnt alive in Adem Omeragic’s house. Almost all were from Koritnik village and a majority of them belonged to the Kurspahic family. Koritnik was looted and set ablaze. Image: Senad Kurspahic, standing in front of his house in Koritnik next to a board with names of his family who were burnt alive(including a 2 day-old baby) in Adem Omeragic’s house in Pioneer street in the center of Visegrad. Image: Visegrad genocide survivors and family members gather in Koritnik to mark the crimes committed there. Image: Family members place boards with names of victims-their loved ones who were murdered by the Bosnian Serb Army. This examination of the denial of genocide at Visegrad looks at three specific examples: a documentary called ”Na Drini Grobnica”(”Grave on the river Drina”), the works of Momir Krsmanovic, a Serb writer from Visegrad, and the Visegrad report of the Committee for Collecting Data on Crimes Committed Against Humanity and International Law. 1.”Na Drini Grobnica” is a documentary produced by the so-called Concentration Camp Survivors from Republika Srpska organization (”Saveza logoraša Republike Srpske”), featuring the organisation’s Visegrad section (”Regionalnog udruženja logoraša iz Višegrada”). It was produced in 2007 and since then has been repeatedly aired on Republika Srpska TV as well as being available online. One of the people who worked on this ‘documentary’ was Slavko Heleta, a journalist in Visegrad. In addition to making this documentary, they have also organized two conferences on ”Crimes committed against Serbs in Upper Podrinje”. The organization is very close to the SNSD (Alliance of Independent Social Democrats), the party of Republika Srpska Prime Minister and genocide denier Milorad Dodik. The organization’s former vice-president Slavko Jovicic Slavuj, now a member of the Bosnia and Herzegovina Parliament, voted along with all the other Serb representatives in the BH Parliament against proposed legislation that would outlaw Holocaust and Genocide denial. The proposed legislation was based on the EU Framework Decision on Combating Racism and Xenophobia. The RS government funds the activities of this organization and has recently given 50,000 Euro to enable it to sue the Federation of B&H. 2. Momir Krsmanovic, is a notorious Serb author from Visegrad. He wrote the popular novel ”’Even God wept over Eastern Bosnia” (”I Bog je zaplakao nad Istocnom Bosnom”) which deals with ”crimes against the Serb people in Eastern Bosnia”. According to his offical website (http://www.momir-krsmanovic.com/), Momir Krsmanovic was a survivor of Ustasa crimes committed at Sjemec near Visegrad in 1941. He survived these atrocities because ”Almigthy looked after him”. He boasts that he was able to write ”Even God wept over Eastern Bosnia” in a monastery on Mount Ozren thanks to Vasilija Kacavenda, the infamous Bishop of Zvornik who was very close to Radovan Karadzic and Ratko Mladic. Kacavenda built his own residence on confiscated Bosniak property in Zvornik and is notorious for refusing to remove the Church built on the property of Nana Fata (”Granny Fata”) near Srebrenica. Krsmanovic publicly brags about his close connections with the Orthodox Church (see here). His book is written as a historical novel, supposedly based on eye-witness accounts. It makes no mention of Serb crimes, instead Krsmanovic describes Bosniaks slaughtering Serbs and dumping them in the Drina river, rapes by Bosniaks etc. The novel is fascist propaganda aimed at young Serbs in Eastern Bosnia, like the film ”Pretty Village, Pretty Flame”. Krsmanovic is also the author of ”The Blood-Stained Hands of Islam”, ”The Bloody Drina Flows” etc. 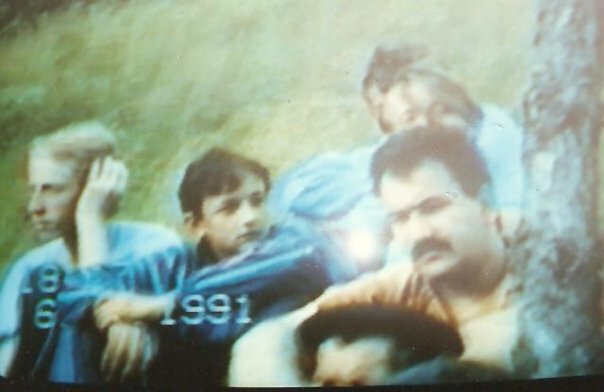 Image: Abdullah Kahriman, Bosnian Army soldier, giving a taped forced confession to Visegrad Serb authorities. He has been missing ever since. 3. The Committee for Collecting Data on Crimes Committed Against Humanity and International Law was formed during the war with the primary aim of spreading propaganda about crimes committed against Serbs in Bosnia. The committee produced a report on every town, especially Visegrad. These reports were used by Slobodan Milosevic’s defense at The Hague and can be found online. The committee gathered information from the courts in Visegrad. Two names recur: Judge Radmila Radisavljevic (later Zeljko Lelek’s defense lawyer) and Prosecutor Lazar Drasko (later a defense witness for Milan Lukic in the Sjeverin trial). Drasko is still a prosecutor in the Bosnian Federal courts and the authorities have ignored victims’ calls for his suspension. Radisaljevic is working as a lawyer in Visegrad. It is important to note that neither comes from Visegrad – Drasko is from Capljina and Radisaljevic from Zenica. Victims have repeatedly called for the criminal prosecution of both, but the authorities have ignored those calls. The most infamous case involving these two is that of Abdullah Kahriman, a Bosnian Army soldier captured by the Bosnian Serb Army near Visegrad. Kahriman escaped from Visegrad in ’92 and joined the resistance. He was captured, interrogated by the Visegrad authorities, tortured and forced to confess to war crimes. His forced confession is used by the Committee and also used in the propagandist documentary ”Grave on the River Drina”. His whereabouts are unknown. He was last seen in Visegrad, in the custody of the court authorities. He was probably murdered. These are the three sources of information concerning Visegrad or Eastern Bosnia to be found on Serb websites. More recent evidence of genocide denial by Visegrad Serbs can be found in comments in Internet forums, Facebook discussion groups etc. : ”What happened, happened! Let’s look towards the future”, ”The war ended 15 years ago. Don’t talk about it!”, ”I really don’t know why you people left, you are welcome to return any time”, ”We all committed crimes, now let’s not talk about it”. Image: Bosnian Serb soldier harrasing an unidentified Bosniak elder, Visegrad 1992. There is another aspect of denial that particularly concerns Visegrad – the Lukicization of war crimes. This is the tendency to place the blame for every war crime committed in Visegrad on Milan Lukic. It seems now that Lukic himself ordered and executed every crime committed in Visegrad. But don’t forget, Milan Lukic was a member of the Visegrad Brigade of the Bosnian Serb Army. This is an established fact, mentioned at the Sjeverin trial and confirmed by Branimir Savovic (SDS President) and Luka Dragicevic (Commander of the Visegrad Brigade). Lukic had a superior. He received orders and he obeyed orders. There is a chain of responsibility behind the commission of these crimes. And finally, last but not least, it is worth repeating that the main role in the Visegrad genocide was played by the Crisis Committee in the Visegrad Municipality. Žlijeb is a village in Visegrad Municipality. According to the 1991 census, it had a population of 179 out of which 142 were Bosnian Muslims. The entire Muslim population was either driven out, murdered or sent to concentration camps in the Visegrad Municipality. All Bosniak property was destroyed and the village mosque was burnt down and the minaret dynamited. Until now only Boban Simsic has been on trial for crimes committed in this village. Image: The interior of the Zlijeb mosque built in 1550. Image: A tree has grown in the middle of the mosque. In the rear is the mihrab. Image: The mosque burnt down and the minaret dynamited. Image: The mosque burnt down and the minaret dynamited. Notice the top of the minaret stuck in the ground due to explosion. Image: The top of the minaret stuck in the ground due to explosion when the minaret was dynamited. Image: Straziste mass grave, Visegrad, Bosnia&Herzegovina. This new mass grave was located in Straziste cemetery. The site was covered with garbage. Among the remains of Bosniak victims were roof tiles, rubbish and especially lime. Information about this mass grave was given by local Serbs: a dying Serb who was witness to the disposal of these bodies. Read more about it here and see the Part 1 set of pictures here. Image: The monument in Barimo dedicated to Bosniak genocide victims. Barimo, a all- Bosniak village near Visegrad, was attacked by Bosnian Serb Army forces in August 1992. 26 Bosniak civilians were killed and the village was set ablaze. A few days ago, survivors of this crime came back to open a monument to their loved ones. The monument was opened by Emina Bajric, one of the rare survivors of the massacre. Image: Article about the opening of this monument in Dnevni Avaz. Image: The opening of the monument in Barimo. Image: Bosniak Genocide survivors, praying in front of the ruins of the Barimo islamic school (mekteb) which was destroyed by Bosnian Serb Army during it’s attack on Barimo in August 1992. Read more on destruction of mosques in Visegrad Municipality here.